GRAND PRIZE: $500 Gift Card to Sephora or Target. Your choice! SECOND PRIZE: $250 Gift Card to Sephora or Target. Your choice! Either prize would be just the thing for upcoming holiday shopping, a gift for a special someone or the perfect way to treat yo self! 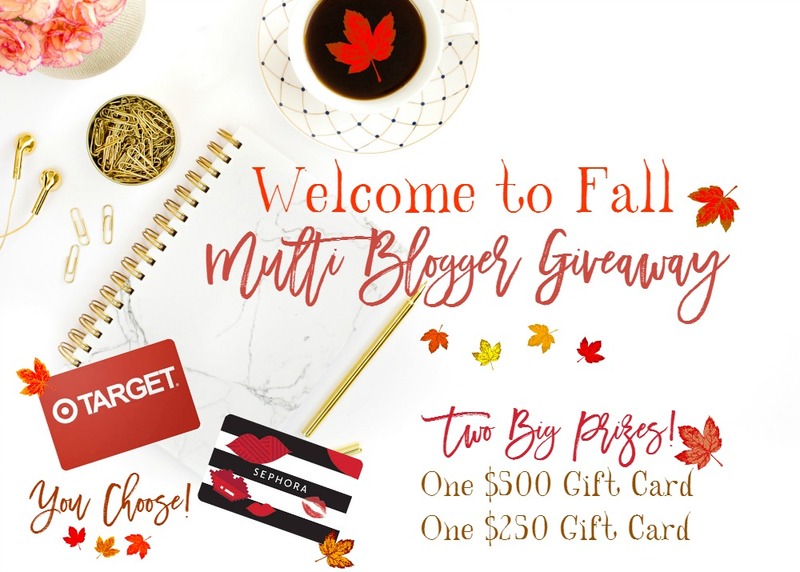 Everyone gets one free entry to get started then you can support all of the wonderful bloggers sponsoring this giveaway by moving down the Rafflecopter widget, for extra entries. The more entries you complete, the more chances you have to win! I know that there are a lot of entries - (150 in all!) - and that it can be a rather daunting task to do all at once. You can break up the entry process, if you like. Do some, bookmark my page *if you haven't, already and come back to complete the entries at your leisure. You have until SEPTEMBER 26th, 2016 at MIDNIGHT EDT to complete all of the entries and the prizes being offered make it worth it so be sure that you get every opportunity you can to win! Are you ready to get started? Great! Grab your favorite beverage, a snack, limber up those follow fingers and dive in to the Rafflecopter widget, below.